The two big names in Portuguese classical music from the 20th century are Joly Braga Santos and his teacher Luís de Freitas Branco. 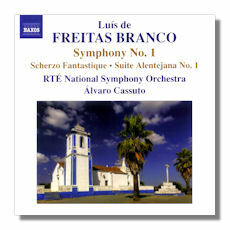 Naxos and its related label Marco Polo have taken a good stab at Braga Santos's symphonic output, and now Naxos is turning its attention to Freitas Branco. This is the first of four slated CDs to be devoted to this composer's rchestral works. It contains one work not previously recorded – the Scherzo Fantastique. This was composed when the composer was 17, and frankly is of more value to completists and to those who want to trace the composer's career in detail. Musically, it is not very strong. The other two works are understandably more mature, if somewhat derivative. The Symphony #1 (1924) carries a debt to César Franck, notably to the Belgian master's Symphony in D minor. Like its model, Freitas Branco's symphony is in three movements, and a theme that appears in the first movement reappears transformed in the Finale. Some of the orchestral writing sounds as if it would work very well on an organ, too. The composer's writing isn't consistently inspired, but most of it is on a high level, and the themes generally are distinguished and memorable. Alentejo is a region of Portugal south of Lisbon. Conductor Cassuto, who also wrote the booklet notes, states that the suite "is based on the rich musical folklore of the region." I am not sure if he's saying that Freitas Branco used actual folk melodies in this suite and its successor, but be that as it may, this is the only music on the CD that one could readily place as coming from the Iberian Peninsula. The suite starts atmospherically with snatches of shepherds' songs in the pastoral Prelude. The central Intermezzo rocks back and forth gently; it is like being in a swing on a summer day. The Finale is a wild and colorful fandango – heavy on the castanets! Cassuto writes that this is the most popular movement in the Portuguese orchestral repertoire. I can hear why, but I think Freitas Branco is better when he is less obvious. There's no doubt that Cassuto is an expert conductor in this repertory. He's been an advocate for Portuguese composers for many years and has plenty of recordings to his name. The Irish orchestra – it is associated with Ireland's public radio – is capable and obviously well-prepared. Especially in the symphony, though, the strings lack richness, so this recording cannot be considered ideal. I doubt, however, that other labels are clamoring to record a Freitas Branco series – more's the pity – so I can live with this orchestra. The recording was made in Dublin's National Concert Hall, and is honest and detailed.